(Chongqing Morning News via Hexun Media) By Cao Liang. January 19, 2007. Brief Biography: Traveled overseas all over the world and lived in Switzerland; studied Economics at Friedberg University (Germany) for one year before quitting; engaged in export trade thereafter; promoted the Internet personalities "Tianxian MM" and "Extraordinary Real People." "Usually, apart from chatting on the Internet and playing games, I love to travel. The world is so vast, and there is so much for me to learn." This energetic middle-aged man immediately told us about what he likes. For that reason and also because this is so easy to publicize, he chose the Internet nickname: "I travel all over the world, so where is my home?" Later, he was just called by his close acquaintances with the abbreviated nickname "Brother Lang" and "Old Lang." Old Lang is not a media mogul. He is not an entertainment agent. But he has created some Internet legends whereby formerly unknown individuals were turned into Internet celebrities. Tianxian MM from the mysterious Qiang village and the Extraordinary Real People group who drifted from elsewhere to Beijing changed their personal fates after encountering him. He is acknowledged as the Number One Internet Promoter today. "If he picks someone, they will be hot." Such is the netizen opinion. Therefore, his business card has this phrase printed: "Number One Internet Promoter In The World." When our reporter called Brother Lang, he was with the "Extraordinary Real People" making a program in Changsha (Hunan). Although he was busy, Brother Lang was energetic and talkative. He was very confident about his goals and future plans and he sounded ecstatic. Brother Lang said that he had been invited to speak at universities, Sina.com, Baidu.com and other major websites, but he preferred not to talk about himself. He would rather discuss his Internet enterprises. "I try to avoid it all the time. When a radio station asked me to discuss my experience, I rejected them immediately." Brother Lang said, "It is better to maintain some sense of mystery." The new term "Internet promoter" is explained on the Internet as: "The people who are the first to present eventual Internet stars." But Brother Lang said that most people are simply referring to the "hired hands": "They were only bringing up the subject of discussion. But what I do involves the complete process of packaging and promotion after the subject has been brought up." Brother Lang said that he has become more professional. He has established a company in Beijing known as the Brother Lang Workshop. The company is located in the Xuanwu district of Beijing; it has only a small space in a residential building and simple facilities. Brother Lang said that the current Internet production standards can be achieved by a single new computer that has fast Internet access speed. But each production member should be a professional either in concept or technique. "I have not been an Internet promoter for a long time. I should be called an Internet planner at this time, or an Internet content provider. My idea is to create a business out of creating Internet stars and become the first such Internet company to be listed on the stock market." Brother Lang meant every word that he said. He said that he has just been nominated as one of the top ten Internet planners by the Tianya forum. "I really like that title." Brother Lang said that even though he is more than 40 years old, he is no less progressive than young people in their thinking. "When I'm with the young people, I'm usually the person who comes up with the good ideas. As for the highly popular Tianxian MM, Brother Lang said: "That was just an accidental encounter during my travels." "It was a trip to the Aba dam. This was a highway that I had gone through many times before. There was a dam where I could stop my car. So I stopped the car and I began to look for water to wash my car window. Then I saw her. She was facing the road. At the time, she was not wearing a full Qiang costume; she only wore a Qiang top coat. I found this girl to be unusually beautiful and she conversed exceptionally properly. I asked for permission to photograph her. She said alright and asked me to send the photographs to her afterwards." Brother Lang then started posting the photographs of this pretty girl onto a forum about car tires and made up the name "Tianxian MM" (literally, Celestial Goddess sister). Unexpectedly, there were many comments and the Internet response was tremendous. So the encouraged Brother Land traveled the several hundred kilometers to the Qiang village many more times in order to take more photographs of her. "The results astonished me." Within two months, "Tianxian MM" because red hot on the Internet as many of the posts about her gathered hundreds of thousands of hits. She had a large number of dedicated fans who formed the most loyal foundation to "Tianxian MM." Brother Lang analyzed the mind state of the fans: "You think about it. Most Chinese men were looking at the Super Girls, Furong Jiejie (Sister Hibiscus), Mu Zimei and so on. These are either sexually neutral or extreme. Tianxian MM is undoubtedly a breath of fresh air from the wilderness. 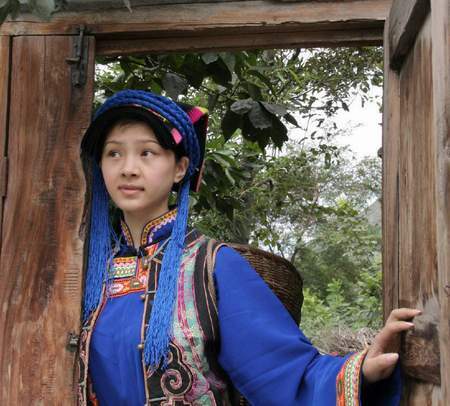 She is pretty, hard-working, kind-hearted and shows filial piety towards her parents. She has all the good points of traditional Chinese women." This warmth soon overtook the scene. Tianxian MM became the focus of the mass media. In the big cities far away from the Qiang village, the photographs of Tianxian MM appeared in all the major newspapers. Her popularity was not less than that of any big entertainment star, and many advertising opportunities came to her. Brother Lang admitted that his accidental discovery of Tianxian MM made him think that there was still a virginal piece of turf on the Internet. "I thought that I can make it." After this, Brother Lang paid more attention to how the Internet can reflect the real aspects of daily life. The "Extraordinary Real People" set of photoplays were inspired when Brother Lang read bathroom graffiti. Last May, Brother Lang was at a sauna entertainment center outside of the Fourth Ring Road in Beijing. He noticed some cartoons drawn on the toilet walls. "The subjects were all about current affairs and famous Internet stories. They were very interesting. At the time, I thought that if these cartoons were photographed with real persons with exaggerated expressions, they would be much more interesting." When he got home, Brother Lang thought about it some more and decided it was a really good idea. So he went out to find some people to actually do it and get daily updates on the Internet. Later, Brother Lang became the chief planner and photographer of the "Extraordinary Real People" as well as the dialogue scriptwriter. "I've lived in Beijing for a long time. I felt that people around me are too serious and tired. This city does not need anything profound; it needs entertainment." Brother Lang told the reporter. "They are slightly better than the people who live in underground basements. They have an extraordinary entertaining spirit. We get together to use an entertaining style to present real life. The fact that so many people support us on the Internet shows that we have struck a chord of resonance on the Internet." So Brother Lang has considered Internet promotion as his business. His company has signed "Tianxian MM" and "Extraordinary Real People" whom he discovered and packaged, and it was natural that Brother Lang should become their agent/manager. As his reputation grew, many more commercial developers are seeking out Brother Lang. He paid for the "Extraordinary Real People" to make a low-budget "Extraordinary Reality" out of his own pocket. A special album for "Tianxian MM" is in production. According to Brother Lang, Tianxian MM has realized more than 2 million RMB in contractual income in just over a year. His contract with Tianxian MM is that the income will be split 30%/70% with the company for all the contracts over different time periods. "The company will get at least half of the revenue." Now that Brother Lang has become an Internet celebrity for being a planner/promoter expert, it has become a professional goal for others to become "Internet promoters." Through the planning and packaging of these people, the Internet becomes a place wherein a "sparrow" can become a "phoenix." People have an obvious goal through which they can realize their material interests: to enter the entertainment field and become stars. "Many people seek me out. There are female graduates from the China Academy of Performance Arts who said that they will pay me 200,000 RMB and hire me as their agent; there are three Peking Opera actresses who said that I can take most of their income if I can make them popular." Brother Lang continued. "Tianxian MM is a case study for success. But I need to work on more than one case study. I need to produce a large number of real cases." Brother Lang believes that the competition among the various big websites does not depend on spending money; it is about the concept. "You must have works that are close to the lives of the citizens; you must have socially relevant themes; you cannot just bank on a temporary fad." Brother Lang is most delighted about that the fact that he has never failed. He is quite proud of that: "It is always those professional website that fail. For example, a certain website spent more than 1 million RMB on a star search, and got some famous directors and stars to promote the campaign ... as another example, another website asked for applications while offering 'We are going to hold popular elections' and 'We offer prize money' even before they started. What was the result? After spending a few million RMB, the 'stars' that they created do not impress." "The stars created by the professional websites compete against us. But they overestimate the strengths of their platforms, so that they do not improve on themselves. Besides, their feel about the Internet is not as good as ours. They don't know what netizens want at all. Besides, it is increasingly difficult to build Internet stars because the netizens are becoming inured to the process ..."
Brother Lang said that he has traveled in many countries. "But I get a sense of accomplishment only when I come back to China and work." Yesterday, he went with the "Extraordinary Real People" to collect the "2006 Internet Fashion Champion" award at Sina.com. Many famous people were there, but they were the only grassroots people. Finally, Brother Lang told the reporter: "The company is getting on track. We are expecting to see more professional work, as opposed to stuff that are more elegant but distant from the people." Relevant Link: The Real Story of Tianxian MM (天仙MM) ESWN, Septmeber 21, 2005.